Let's try another, somewhat more difficult, volume example. In this example, we want to find the volume of a propane storage tank. This is a particularly important task including some details that are not purely mathematical, and there are some safety issues. Propane storage tanks are an interesting technical challenge because propane wants to boil at normal environmental temperatures. The most efficient storage state for propane is as a liquid, and the only way to maintain its liquid state at room temperature is to keep it under pressure. In order to avoid the risk of bursting the tank as a result of temperature changes that expand the propane's relatively incompressible liquid phase, the tank may not be filled beyond 80% of its full capacity. 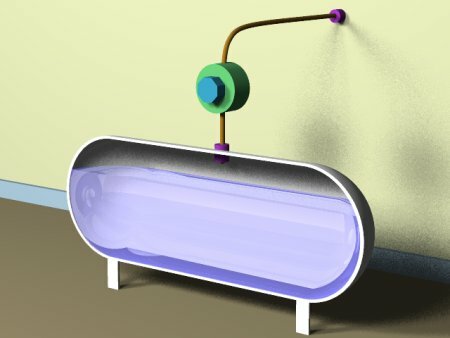 Our task is to create a mathematical treatment for a typical propane tank — we need to determine its full volume, and we need to determine an 80% capacity point, to allow safe use of the tank in widely varying environmental temperatures. If we fail in our mission, someone will get blown up, so we need to be rigorous and careful with this problem. All right. That should take care of those few who may think Calculus is always an esoteric pursuit with no real-world consequences. That is only sometimes true. Remember from our previous volume examples that we can integrate to acquire a line from a point, a surface from a line, and a volume from a surface. That is exactly the approach we will use here. Another half-sphere at the right. For a tank with a length of 32 units and a radius of 4 units, equation 8 produces a result of 1792 π / 3 (1876.58...) cubic units. Our result shown as equation 7 produces the same result if we apply the argument y = 2r, so our result has passed one test. There is another test we can perform, one based on common sense. Because we evaluate the tank's volume by taking horizontal slices, we can see there is little volume at the bottom and top of the height variable's range, and more in the middle of the range. If we plot equation 7 against the height in the tank, we should see an s-shaped curve with little volume change near the ends of the range of height values, and large volume changes in the middle range. Such a graph appears on this page and it confirms our assumption, so our result has passed another test. Finally, in connection with determining the 80% volume safe fill point, we would like to be able to acquire an internal liquid height for a given volume argument. Unfortunately, because of the complexity of equation 7 (in particular because of the appearance of the dependent variable y both inside and outside the cos-1 function), creating a suitable form that produces a height for a volume is not practical. This means we must rely on yet another numerical method, this one called "root finding." One can perform a primitive kind of root finding with pencil and paper, and there are many computer programs used in mathematics that include root finders. Even spreadsheet programs of recent vintage possess this ability (usually a feature called "goal seek"). In essence, a root-finding approach for this problem would interpret equation 7 as a volume function v = f(y) and ask "if v = 80% of full, what does y equal?" For our example values above, a tank with a radius of 4 and a length of 32, the full volume is 1792 π / 3 or roughly 1876.58. 80% of this is about 1501.26. We can test y values manually to produce an acceptable result, or we can submit the problem to a root finder to discover that the corresponding y value should be about 5.927 height units. This example is significant for producing a result too complex to allow easy conversion into other forms. We found that we had to use numerical methods to acquire certain kinds of results, even though the problem itself yields a closed-form solution. There are many such real-world Calculus problems.